If you weren’t born into the world of Celiac Disease and gluten intolerance, you have probably consumed and become obsessed with these little snack cookies known as Fig Newtons. You know, those fig rolls that are made of a pastry dough with a figgy jam filling. They are magical. Fruity and savory all at once. They make the most perfect cookie, for sure. And I was obsessed with them, growing up and as an adult. But when I was diagnosed with Celiac, this was one cookie I couldn’t find anything that came close to equaling. I totally gave up thinking about it, for fear of just becoming depressed over a snack long gone. Sure, there were a few companies out there that gave them their best shot…but they weren’t the same. Not even close. Then, back in July, I won a giveaway put on by Gluten Free Frenzy, that meant I won a package of each of the four flavors of the newest attempt at fig cookies on the market. The difference this time was…it was made by a company I was familiar with and trusted. Enter Pamela’s Products Gluten Free Figgies & Jammies. As I mentioned, the cookies came in four different flavors: Blueberry & Fig, Raspberry & Fig, Strawberry & Fig, and Mission Fig. Prior to the giveaway, I had managed to find a couple of the flavors at The Raisin Rack in Columbus, Ohio, and had to choose one. I went with the blueberry. And I fell in love with them. I mean, they reminded me so much of Fig Newtons that I think I actually teared up when I took my first bite. But there were three other flavors to try…and now…I had all four in my pantry. These past few weeks, I’ve been going through a big pantry purge…and in doing so, I’m eating some of the products that I have been negligent in actually consuming. Not that they are bad, I just get distracted from the unprocessed foods I have in my freezer and fridge. It happens, friends. It happens. Well, tonight, I tore into the fourth and final flavor of Pamela’s Products Gluten Free Figgies & Jammies. Tonight…it was all about the Mission Fig. I had actually wanted to save this flavor for last. And I am so glad I did. Just like the previous three flavors, the Pamela’s Products Gluten Free Mission Fig Figgies & Jammies are big…larger than any Fig Newton out on the market. Being that I am a cookie monster at heart, the bigger the cookie, the better. The cake-like outer layer is so soft and moist, beautifully encasing the figgy jam on the inside. The fruit itself is full of great flavor. Seriously. Each flavor I ate, I enjoyed it more than the previous one. This held true once more. The Mission Fig is my absolute favorite…mostly because they taste exactly like…if not better than Fig Newtons. And being that it’s been three years since I had a Fig Newton, I turned that judgment over to my roommate. Cathy said they were right up there, if not better than Fig Newtons and Fig Newmans for that matter. It was the cookie I have been waiting for. Soft, delicious, fruity and perfect. Each bite was perfect. I only wish the serving size was more than one cookie. With that being said, let’s talk about the ingredients that go into Pamela’s Products Gluten Free Mission Fig Figgies & Jammies. The cake-y outer layer of these cookies are made from a flour blend that consists of brown rice flour, white rice flour, tapioca starch sweet rice flour, and xanthan gum, added into evaporated cane sugar, organic non-hydrogenated palm oil, organic invert sugar, grape juice and whole rice syrup, sweet whey powder, glycerin, baking soda, xanthan gum, sea salt and lemon oil. The jam fruit filling is made up of mission fig paste blend, organic invert sugar, grape juice and whole rice syrup, pectin, glycerine, flour base (brown rice flower, white rice flour, tapioca starch, sweet rice flour, and xanthan gum), citric acid, sea salt and gluten-free flavor. These cookies are certified gluten-free, egg-free, contain no artificial flavors or additives, no hydrogenated oils or trans fats, no corn syrup, are low in sodium, kosher, and are cholesterol free. 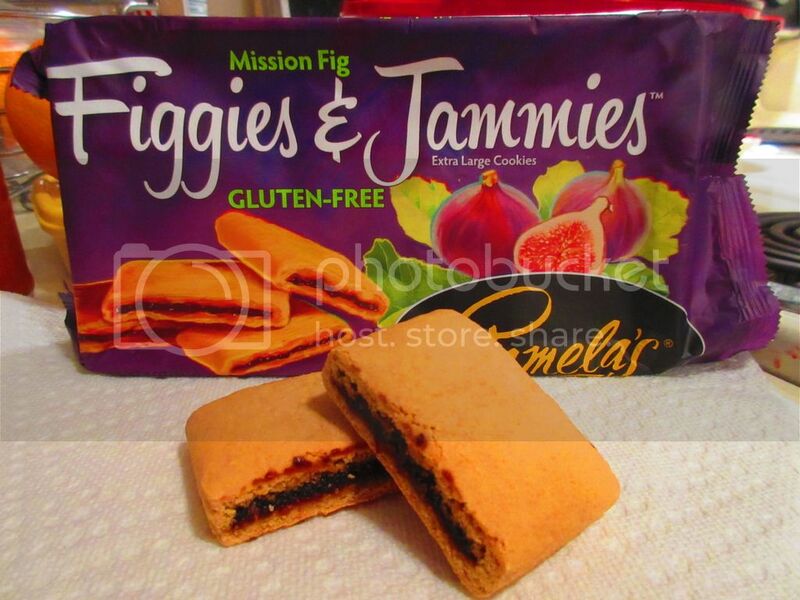 As far as nutrition goes, a serving of the Pamela’s Products Gluten Free Mission Fig Figgies & Jammies is one cookie. This serving will provide you with 90 calories and 2 grams of fat. These cookies contain 40 mg sodium and 11 grams of sugar. You will also be consuming 17 grams of carbohydrates, 1 gram of fiber, and 1 gram of protein. A light, and non-filling snack or dessert. LOVE IT. And you will love these too. If you are a fan of figs…if you loved Fig Newtons…if you have friends who aren’t gluten-free but love Fig Newtons, then you (and they) will surely love these. Honestly, one of the healthiest, tastiest, best gluten-free cookies on the market. They may remind me of a favorite treat as a child, but they taste so much better…and that is a treat in and of itself. This entry was posted in Cookies, Dessert, Fruit, Gluten-Free, Products, Review, Snacks, Sweet Stuff, Vegetarian by The Celiathlete. Bookmark the permalink. yummy!! follow me to see some cool gfree foods:! !